Permeabilized human peripheral blood leucocytes stained with Mouse anti Human myeloperoxidase FITC / CD3 RPE (DC031). Clone UCHT-1 recognises the human CD3 antigen, which is expressed by all mature T cells at the cell surface. 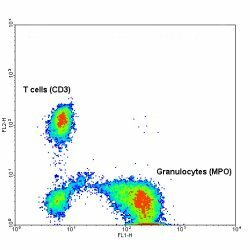 CD3 is expressed in the cytoplasm of immature T cells. Clone 2C7 recognises myeloperoxidase, an intracellular enzyme expressed by cells of myeloid lineage.